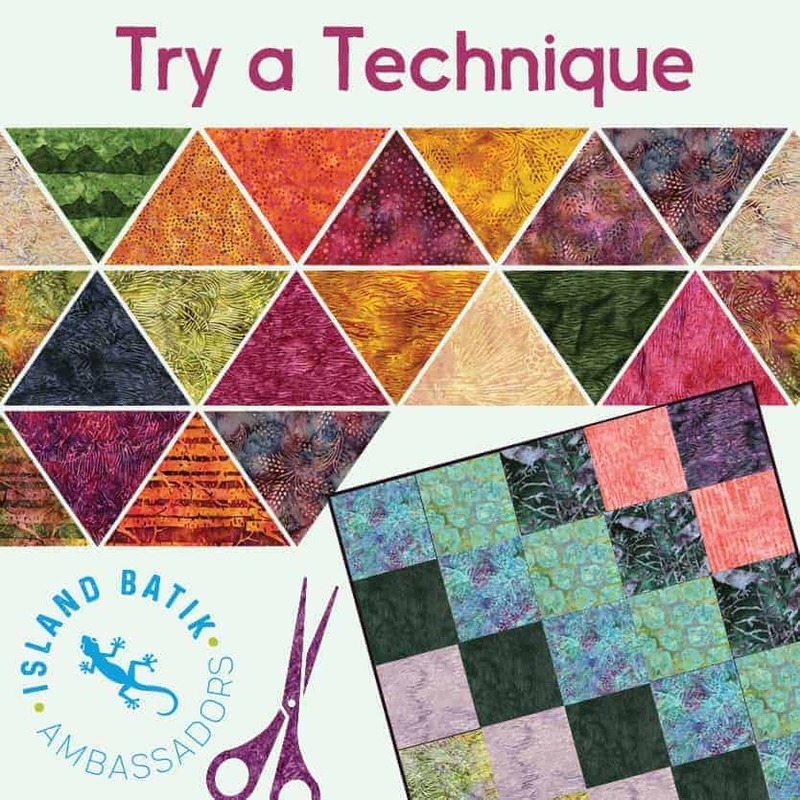 Island Batik Ambassadors were asked this month to try a technique. 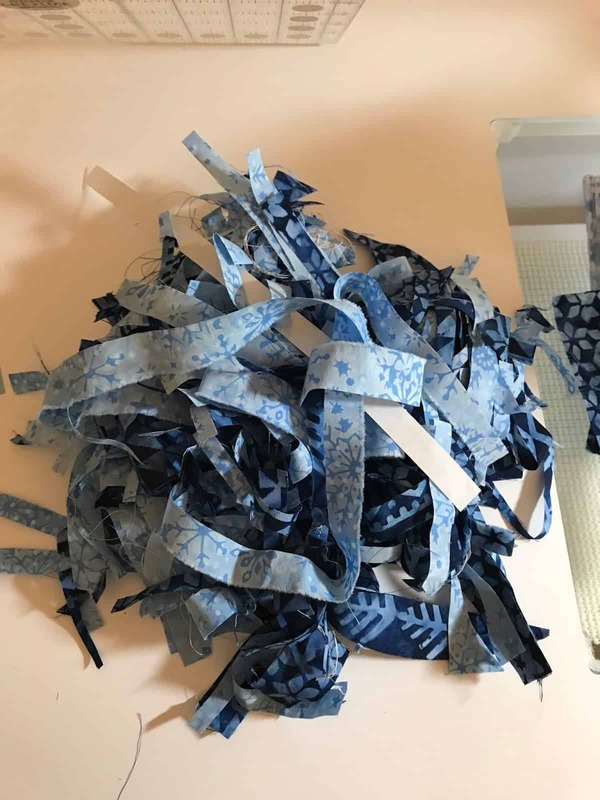 It didn’t have to be a particular size or use a particular line – so the sky was the limit (the fabrics were provided by Island Batik). 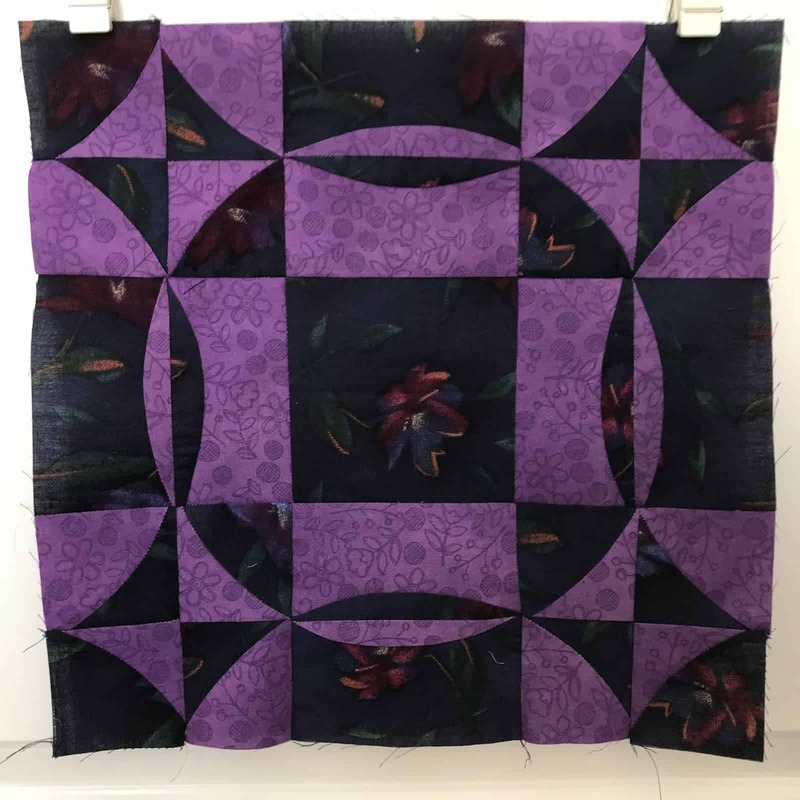 I have been quilting a long time, and worked in a quilt store, so I have tried a lot of techniques. What to do??? 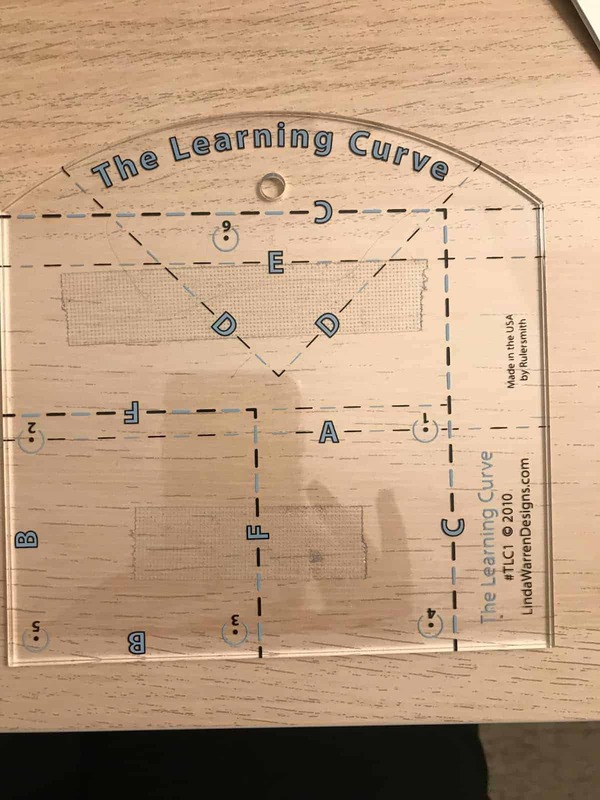 So, here it is – my new technique is using the ruler called “The Learning Curve”. This ruler is quite fun. You can get wonderful circles and create wavy borders. You can find her patterns and her ruler at Linda Warren Designs and also follow her on facebook. The first order of business was this test block. I loved the technique and so I chose my fabrics. 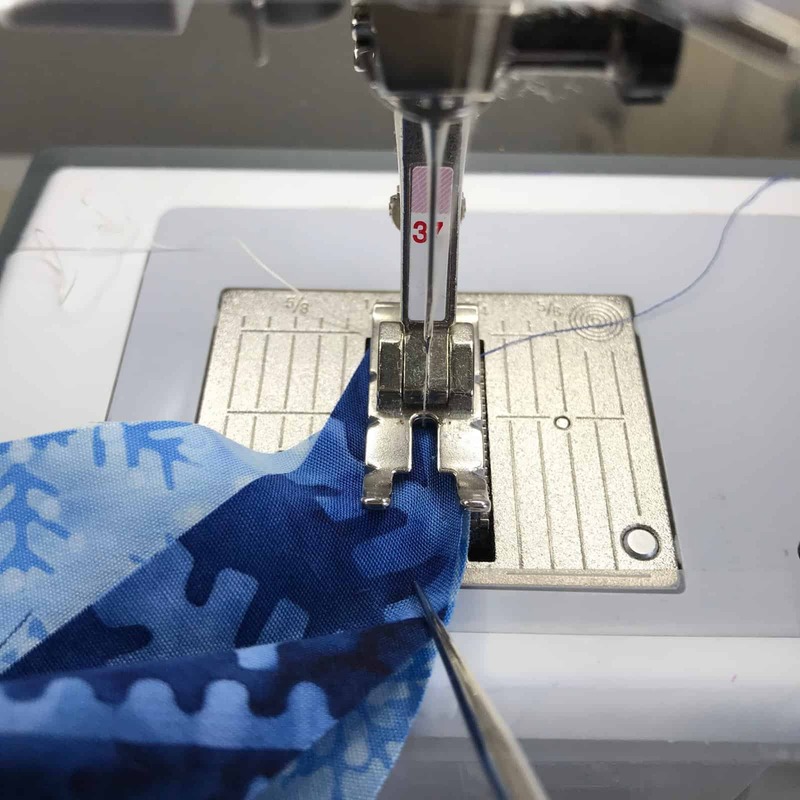 One thing about me is I never do the easiest pattern first – always the hardest. I did watch one of her videos, too, just to be sure that I knew what I was doing. Island Batik sent quite a few fabrics, but it is always hard to decide which group to jump in and use. 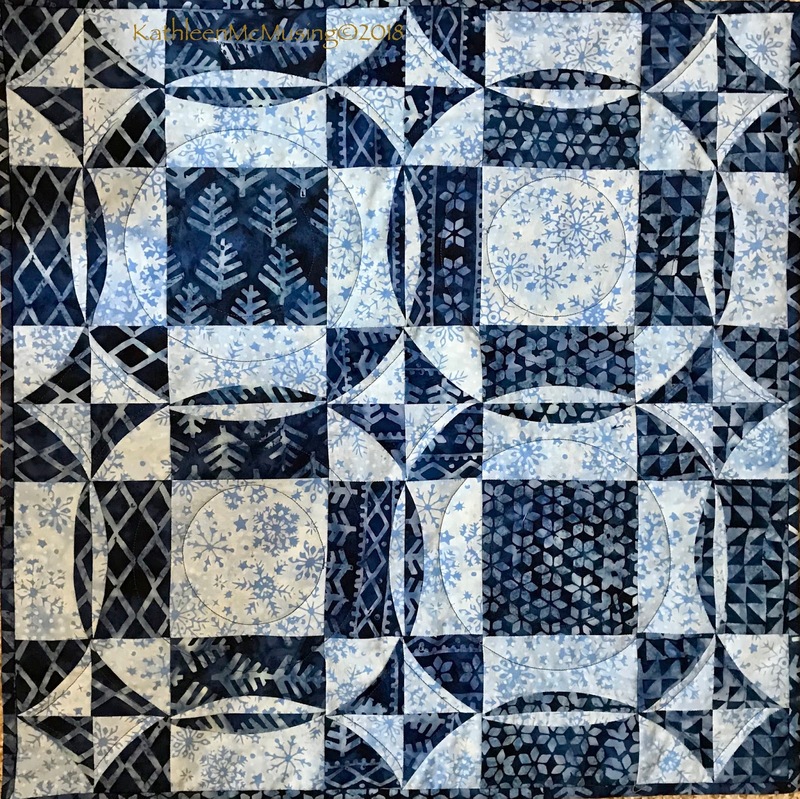 I figured since we have been in the winter of our discontent with 3 Nor’easters in March, I would do my Nor’easter quilt! I would use Alpine Ice! Here is one of the pictures that helped me figure out what I wanted to use. 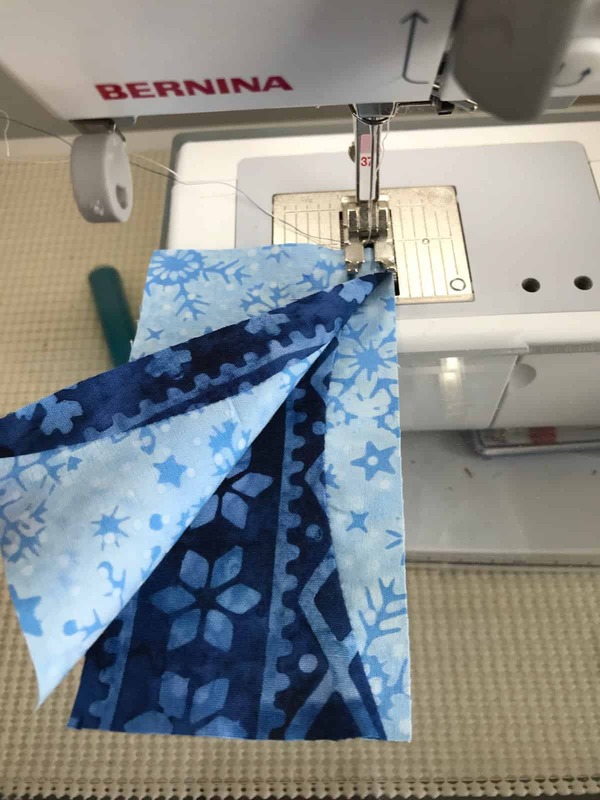 The middle fabric with snowflakes was a little bluer/brighter than the others so I pulled it. out. Funny that the background looks much whiter in that picture. Linda’s business card had the setting I used with a kind of gradation of color across it. I loved the one on her business card but was afraid it would be too busy. I made one section and loved it! I tried to group the fabrics to make it work, but mostly, it think it helped the prints be in a little more control. The other batiks I had were just not going to work, so I decided to go ahead. There was a lot of trimming. Her technique has a good way of giving you plenty of help to get those curves nicely done. Mostly what I liked is that it all really worked well – no puckering – no redoing of seams. I pressed to the dark batiks and that allowed the pieces to nest well when I got to joining the blocks. I highly recommend this ruler. 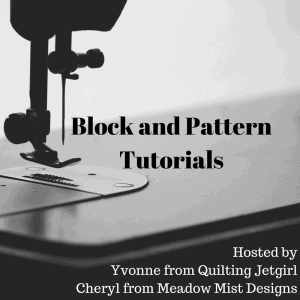 It is a simple easy solution to get some great curves in your blocks! I chain piece when I can, because why not! Here is the final quilt! You can see the quilting on the back, pretty simple as it is a small piece. 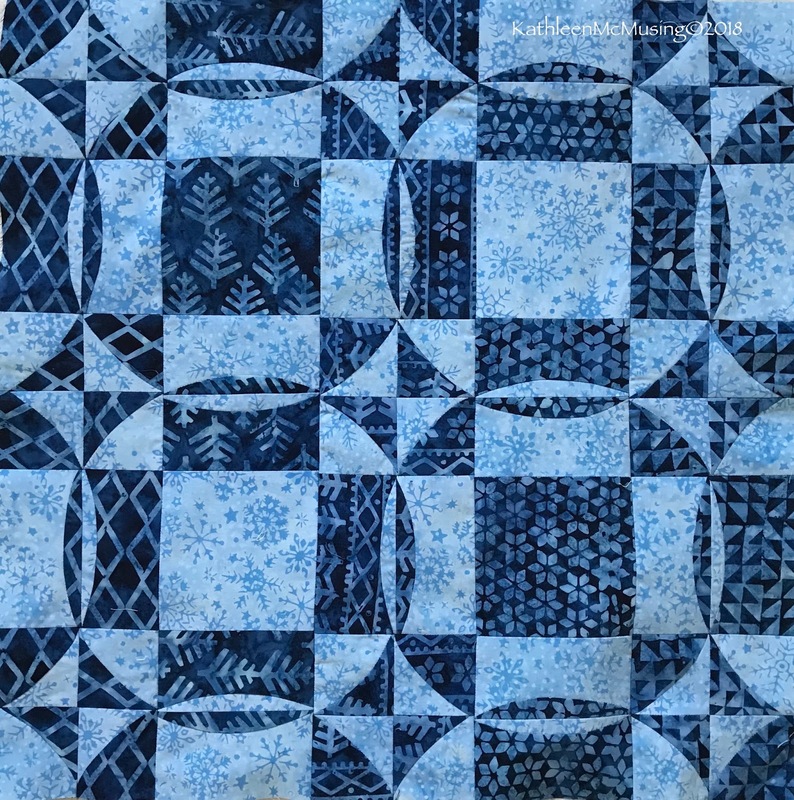 I used Hobbs Thermore batting for this quilt (generously provided by them) and I loved the way it behaved. It is thin but has a bit of loft. Quite nice! Notice there are triangles I used for hanging smaller pieces. In case you were wondering what a whole quilt might look like here’s an example. I used a program called Layout on my Iphone to do this. Note, there is a double row that acts differently and interrupts the interlocking circles, but you get the idea. If you want to see others, you can go to Linda’s facebook page from here. I loved it! I was thinking I wanted a bigger ruler – but maybe not…. 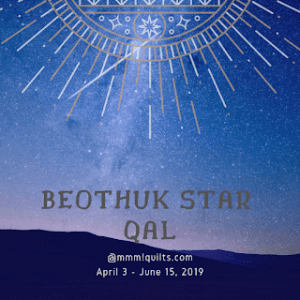 I did add the above link to the section with the "fake quilt" version. It really was fun and I am sure I will use it again! 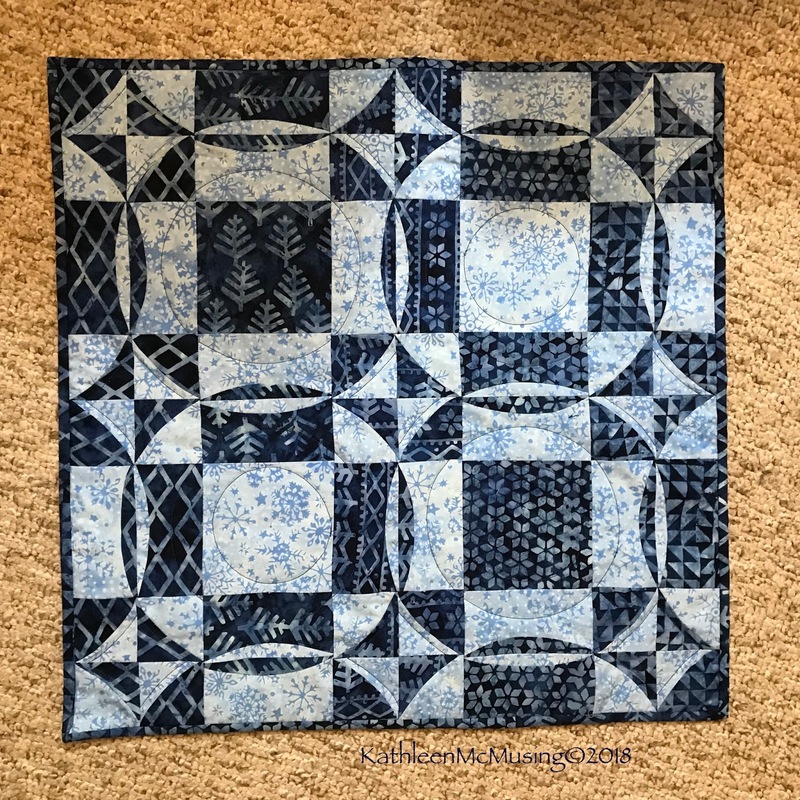 Oh, what a lovely mini quilt! I love how the colors play against each other and those sliver of curves making a larger circle are very enticing. Thank you, Yvonne. 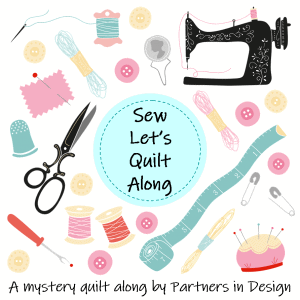 It was really fun and I did love that sliver of a curve – it wasn't that hard with this ruler! How cool!! I love the interlocking patterns this creates! Thanks, Louise. 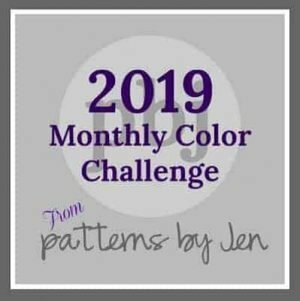 That pattern is exactly what drew me to this pattern! Thank you, Cara. 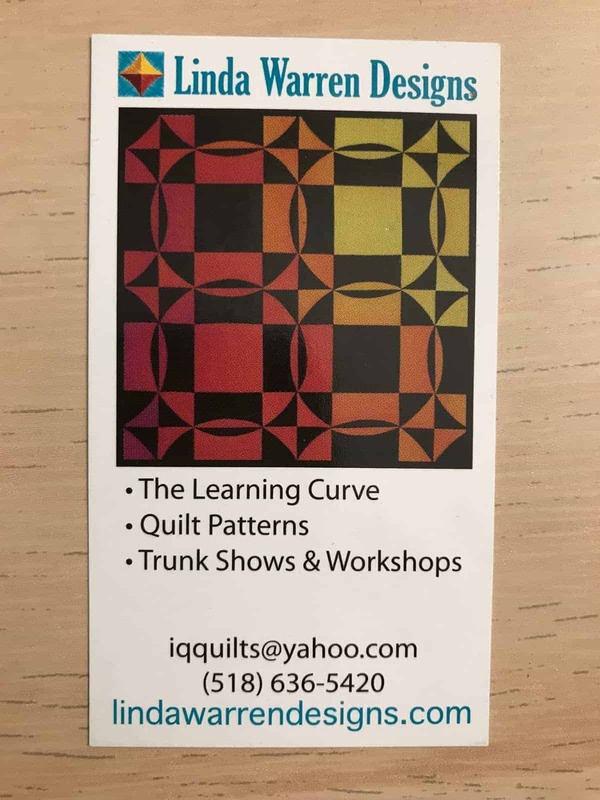 I "made" it up from her business card. 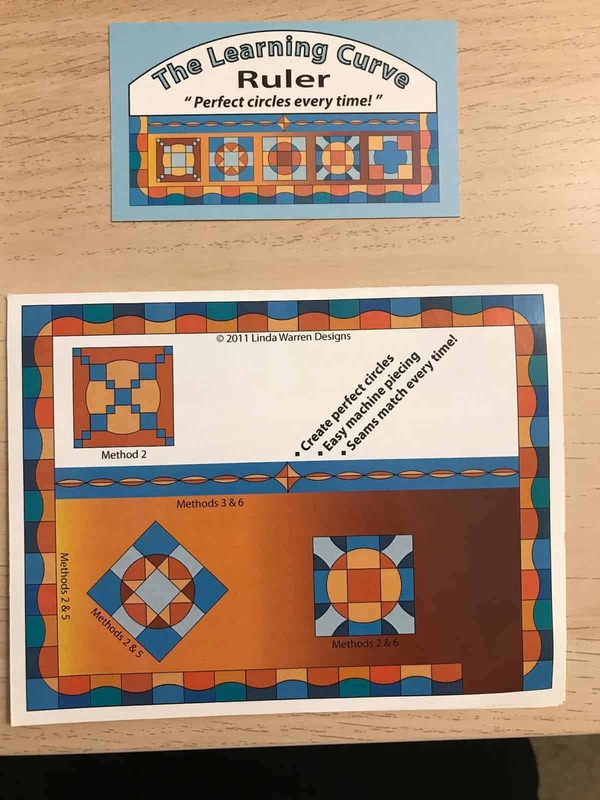 I looked and don't see the pattern on her site, but there is a picture of a larger version than the on the card in the gallery, that is referenced near the "large quilt" version. Thanks–not sure I can make it up though! Will study the larger image & try…. Cara, the pattern is not published yet. I call it "Well Rounded." If you look on the instruction sheet that comes with the ruler, you will see the blocks shown in the bottom row of blocks, and it says "Method 3 & 6." 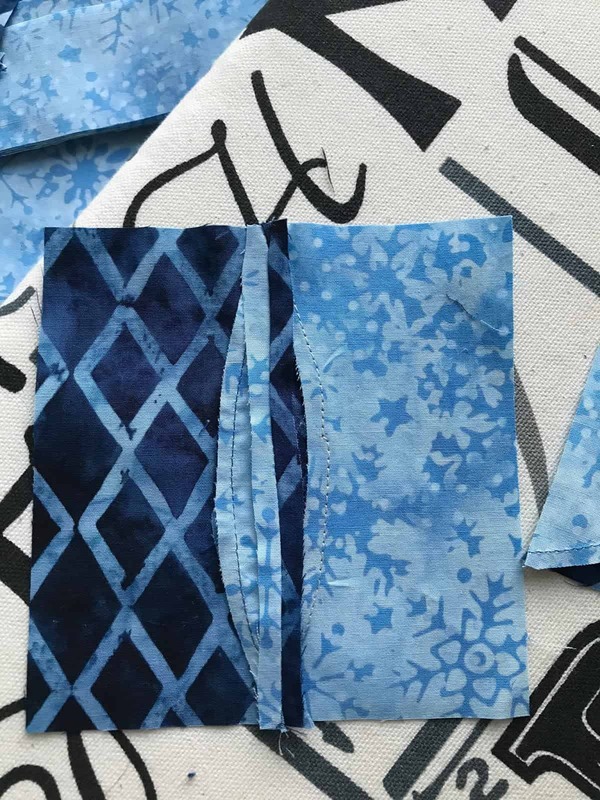 I'm sorry I don't have a step by step pattern for you yet, but if you make a bunch of Method 3 units, and a bunch of Method 6 units, and cut some plain 4.5" squares, you will see the pattern emerge as you lay them out on your design wall. You can do it! 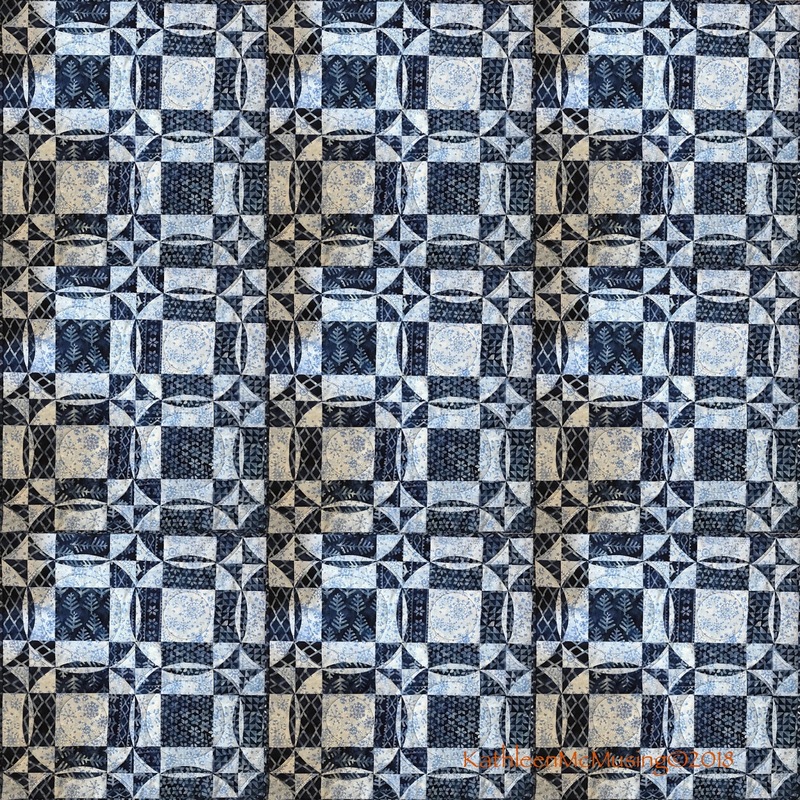 The sample quilt in my website gallery used 1.25 yards each of 2 fabrics: black and gradation. Great! I see it now. Thanks very much. Interesting ruler! That's a new one on me. Your final quilt is a beauty. Great job! I was in love with the technique, once I got going. It was a new one for me and does a really nice job! Thank you, Karen, for stopping by and commenting! That turned out so pretty! 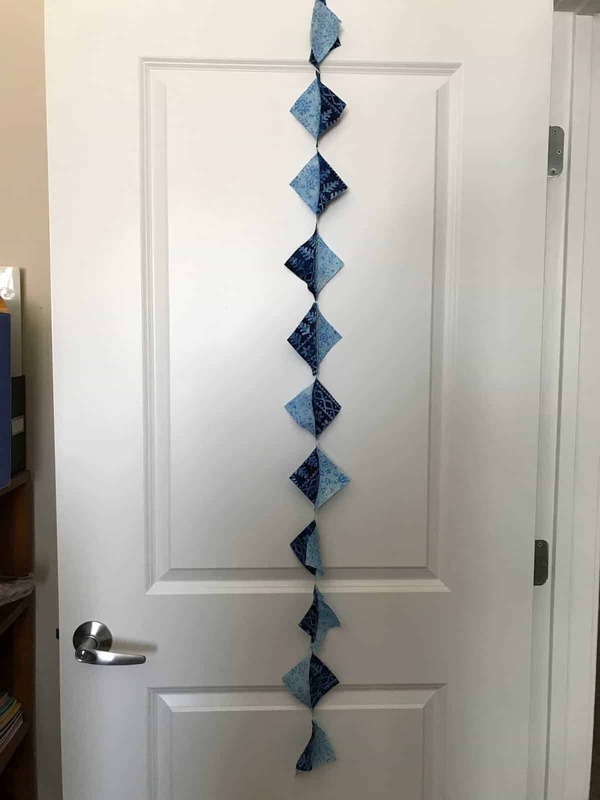 I tried a curved ruler as well, the Sew Kind Of Wonderful ruler, and I loved it! Easy peasy for someone who does not like curves! It was really fun to try this. I have seen the Sew Kind Of Wonderful Ruler but never used it. 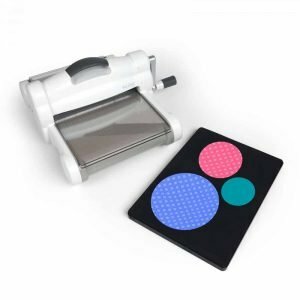 I think it is similar and you are right – Easy Peasy! That's lovely! Curves have never been something that excited me, but this is quite pretty. Your icy colors are beautiful! Thanks, Emily. I totally get your aversion to curves, but, they aren’t too bad with this technique. You have a lot of room for error. LOVE what you did with such a lovely line during a not-so-lovely time of the year for you. This is really cool; who knew a ruler could get such great results? 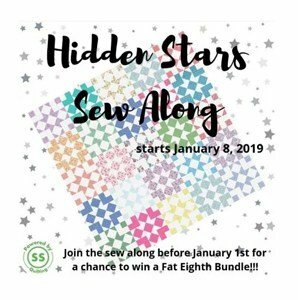 Ha, I'm like you, often picking a harder pattern when trying something new…and like you in the pressing seams open…hopefully like you in a great result! Now I'd better go get 'er done! Thank you so much. I really fell in love with and love the colors, too. Was sad about not getting the ombre effect, but that is hard with batiks! Yup – 3rd thing I knit was an Irish sweater. I am not as cocky as I was as a 20 year old, but it still sometimes shows up. I am beginning to do more pressing seams open. And, me too, gotta get to work and pack up a few things for Paula Nadelstern on Monday and Tuesday! 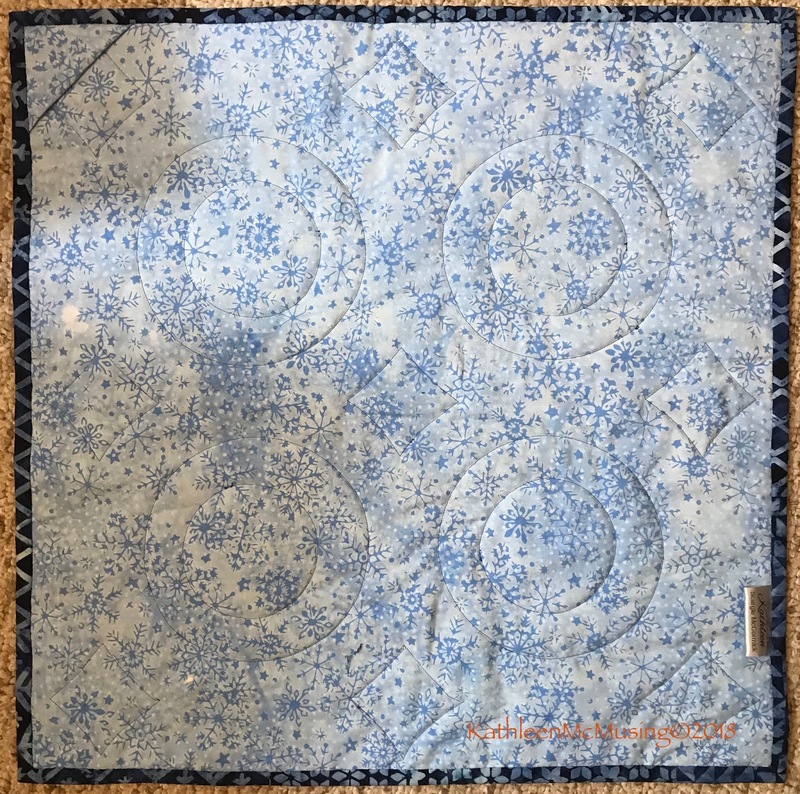 Hello, what is the "fake Quilt version" you mentioned? Blessings.